Born in 1951, Chris O’Doherty aka Reg Mombassa, artist and rock star grew up in the outer suburbs of Auckland and migrated to Australia with his family in 1969. That same year he enrolled in the National Art School, Sydney to study painting. It was at art school that he formed the band Mental as Anything with four fellow art students. O'Doherty has an eye for the absurd, his bold and graphic works are populated by a cast of irreverent, frequently macabre and always distinctive characters. One of these distinctive characters appears in the drawing Transcendental Australian Jesus. 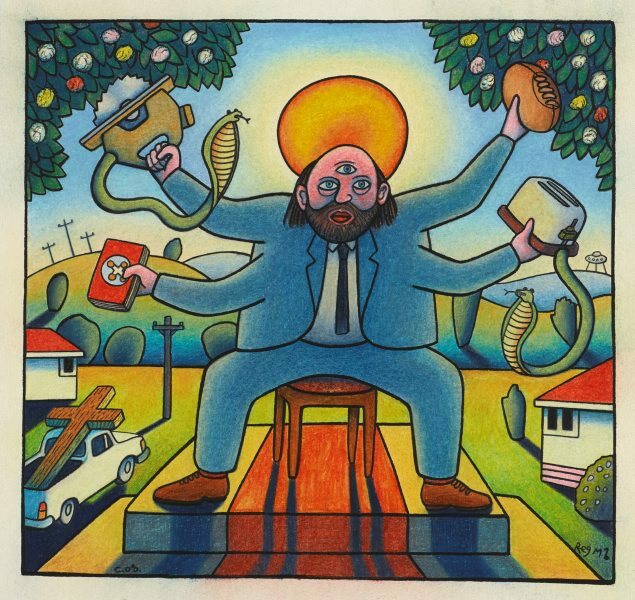 O’Doherty started painting a series on the ‘Australian Jesus’ character in the mid-1990s. The ‘Australian Jesus’ figure appears as a middle-class type, clean-cut and suit-wearing, frequently located in suburban settings. He is often an agent for political messages and examining the role of religion in contemporary culture. The ‘Aussie Jesus’ that appears in this drawing bears many of the physical attributes of the Hindu god Vishnu. This conglomerate deity holds obscure items including a football and toaster sprouting a rattlesnake while he sits in a distinctly Aussie suburban setting surrounded by fibro houses. This work would complement another work, Aussie Jesus heaven and hell, in the collection. Signed and dated l. r. corner, black ink "Reg M 96".